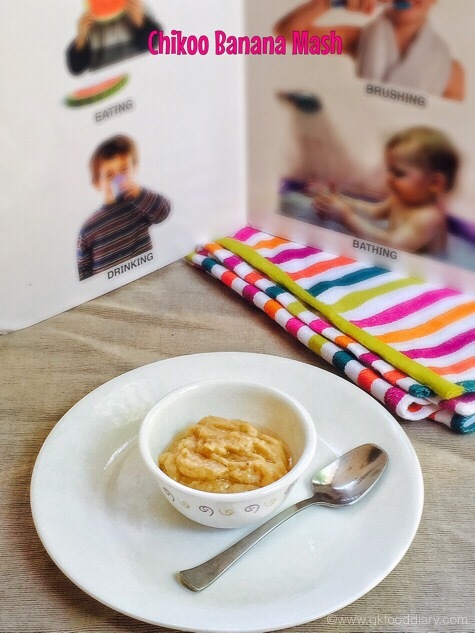 Easy and tasty mash for babies with chikoo/sapota aka sapodilla and banana. Wash chikoo/sapota in running water well. Peel the skin off from the chikoo with a peeler. Cut them into two vertical pieces and remove the seeds. Then chop them into equal size small cubes. Peel the banana and chop them into thin circles. Blend the chopped chikoo and banana pieces in a blender for 5 seconds. Don't blend it to a smooth paste. Alternatively u can mash it well with your hands or using a masher. Add water if it is too thick .